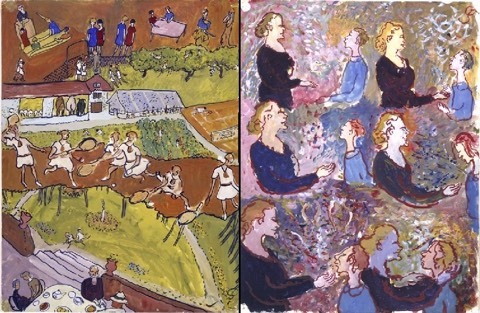 From 1940 to 1942, between the ages of 24 and 26, the German artist Charlotte Salomon created “etwas ganz verrückt Besonderes” (“something really crazy special”). It was the product of the special, crazy times and situation she found herself in. 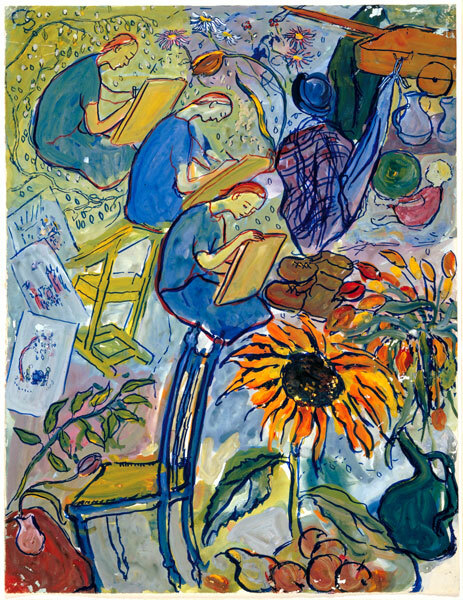 In 1939, because of the Nazis’ mounting persecution of Jews, Salomon had fled Berlin, where she was the last Jewish student at the city’s art school. She sought refuge in France with her grandparents on her late mother’s side in the region of Nice. On March 4th 1940, she watched helplessly as her grandmother threw herself from a window to her death. Only then did her grandfather reveal the family’s secret: she was the last survivor of a maternal line, all of whom had committed suicide over three generations. When she was eight, Charlotte had been told her own mother passed away from influenza; now she learned the truth, that she too had jumped and killed herself. In exile and solitude, under the long shadows of this tragic heritage and the immediate menace of Hitler’s forces, Salomon would barely eat, drink or sleep to finish recording her family’s histories and her personal experiences in an unprecedented magnum opus in pictures and words. 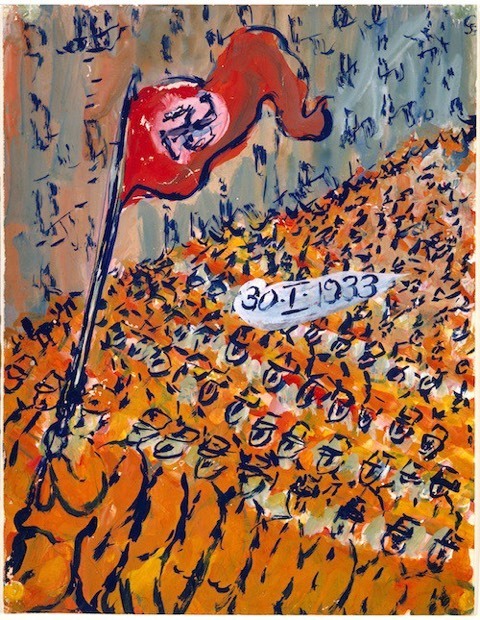 It sprang from an outpouring of around one thousand gouache paintings on Canson paper, made from only three primary colours and clearly influenced by German Expressionists and Marc Chagall. 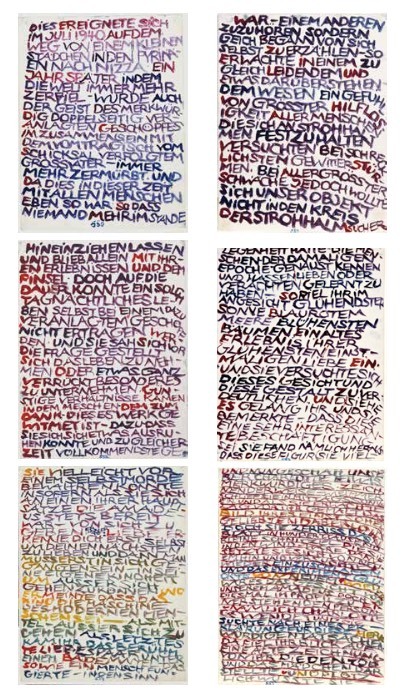 From these, she edited 781 into ‘Ein Singspiel’ or a play with singing which she titled Leben? oder Theater? (‘Life? or Theatre?’). 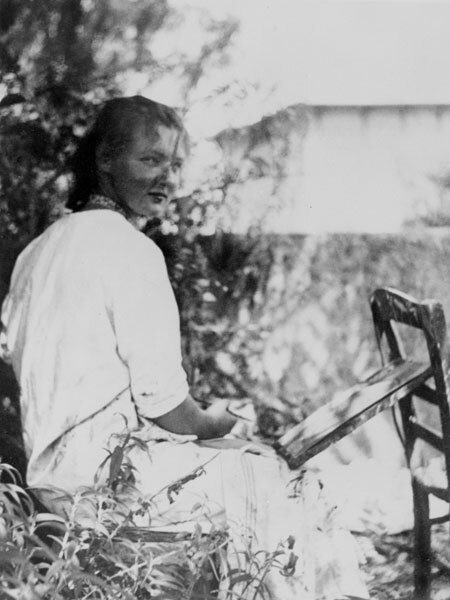 She opened with the suicide in 1913 of an Aunt Charlotte whom Salomon had learnt she was named after. Initially, she hand-lettered characters’ dialogues and thoughts and her narration and musical and theatrical references onto separate libretto-like overlays. 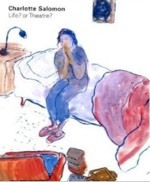 Gradually, her brushstrokes became more loose and she wrote more and more texts directly onto, and into, her images. The penultimate nine paintings are overwhelmed by her densely-packed third-person coda, barely containing the emphatic brush capitals. On October 7th 1943, Salomon, five months pregnant, and her companion were deported to Auschwitz and executed. Fortunately through her doctor, her unseen masterpiece was preserved by her surviving father and stepmother. In 1971 they entrusted it to Amsterdam’s Jewish Historical Museum (where you can browse through them all online). 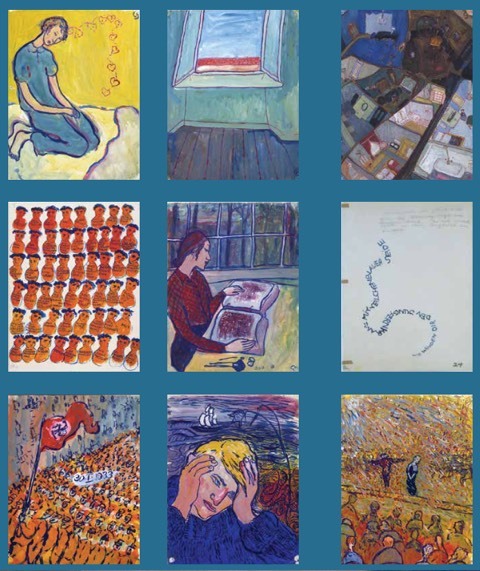 The following year, this Museum exhibited for the first time 250 paintings, less than one third of Leben? oder Theater?. Further exhibitions, including a North American tour in 1983-4 and a showing at the Royal Academy, London in 1998-9, and various editions, catalogues and a CD-Rom have to date given a fuller but not complete impression of this oeuvre. 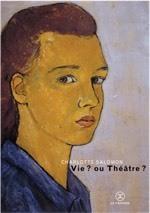 Weighing in at 4.6 kilos with 840 pages of 28 centimetres square, Le Tripode’s Charlotte Salomon: Vie? ou Théâtre? is an 840-page doorstop of a French edition, which at last allows us to see and read her paintings faithfully reproduced at actual size. 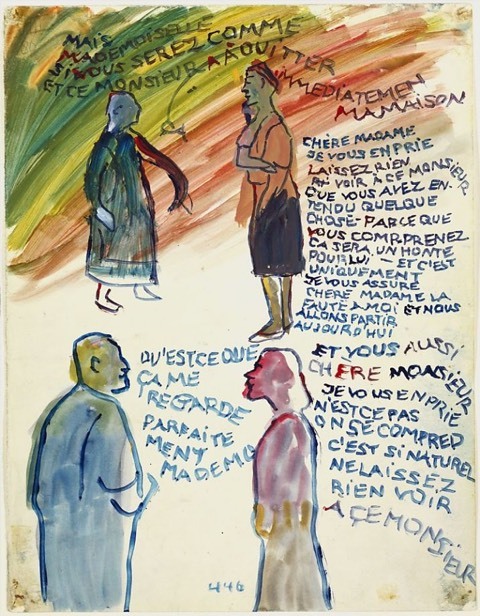 Accompanied where necessary by insets of each of her separate sheets of text with translation into French [see sample below], Salomon’s complex visual-verbal creation can now be appreciated in its entirety. Also presented are insightful essays and a key unseen first-person letter by Salomon. 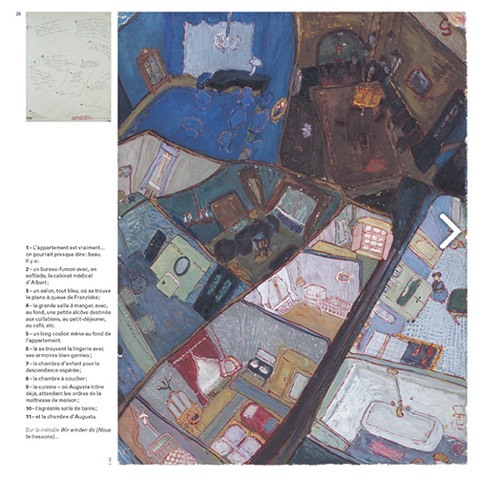 This comprises 25 pages, nine pages at the start and end of typed transcripts of lost paintings, the middle sixteen pages of additional bold text-only gouaches, previously unaccounted for and now restored to their proper context. Dating probably from February 1943, her final public words express a prayer that ‘all humanity, tested by suffering and the hardest experiences, will walk in front of a life that is more true, more alive’. Through such exposure as Franz Weisz’s 1981 Dutch movie and David Foenkinos’ acclaimed 2014 biography, Salomon herself has almost become better known than her work. The atypical hybridity of Leben? oder Theater? has meant that it has remained somewhat marginalised. In 2016, its journey comes full circle for an exhibition at the Musée Masséna in Nice from February 4th to May 24th. It is also becoming more acknowledged for anticipating by thirty years the enrichment of comics through frank autobiographical graphic novels and the rise of women cartoonists, and for its affinity to multi-layered transmedia of the digital age. To paraphrase Salomon’s title, if one asks is it ‘Art? or Literature?’, the answer is surely ‘Yes, and much more besides’. This book review originally appeared in ArtReview Magazine. Le Tripode’s Charlotte Salomon: Vie? ou Théâtre?